Today I found out why Rice Krispies pop when milk is poured over them. Specifically, the popping is a result of the walls of the Rice Krispies kernels fracturing. There are two prevalent theories as to the exact process that results in this fracturing and it’s entirely possible that both are occurring. Rice Krispies, also known as “Rice Bubbles”, in some countries, are created by preparing rice in such a way that it will “pop” like popcorn during the cooking process, albeit much less dramatically. This popping puffs up the kernels. When the rice is finished cooking, most of the Rice Krispies will have thin solid walls with hollow, sealed, areas inside where air pockets have formed. In the first theory of what is causing the fracturing of the walls, the sudden temperature shift caused by adding cold milk to the Rice Krispies causes the air inside the hollow pockets to contract suddenly, which in turn fractures the thin walls of the Rice Krispies, creating the noises. The second theory also involves the fracturing of the thin walls, but by a different mechanism. The thin walls of the Rice Krispies have very strong bonds between the starch molecules, due to the high heat the Rice Krispies were prepared at. When you add cold milk, the sudden shift of temperature puts a high amount of stress on these bonds, due to uneven absorption. This is actually the exact same thing that happens when you pour hot water over a frozen windshield. This dramatic temperature shift causes both the glass in the windshield and the walls of the Rice Krispies to shatter. While Rice Krispies are puffed by preparing the kernels with steam to provide the necessary moisture to the kernels to properly “pop” them, other methods to puff up rice/corn/wheat/etc are also possible. The most popular other method is called “gun puffing”. In this method, the kernels are cooked under high pressure. When the cooking process is at just the right stage, given the particular kernel, the pressure is released, causing the kernel to rapidly expand. This method tends to produce a more spongy end product, rather than crispy, like the method used with Rice Krispies. Another method to create puffed cereal is to use dough, rather than the kernels themselves. In this method, little balls of the dough are rapidly heated using hot air. This causes the moisture in the kernel to rapidly boil off, puffing up and drying out the dough. The popular Rice Krispies slogan in English is “Snap! Crackle! Pop!” In German, the slogan is “Knisper! Kasper! Knusper!” In Spanish, it’s “Pim! Pum! Pam!” In French it’s “Cric! Crac! Croc!” In Sweden it’s “Piff! Paff! Puff! What is a Rice Krispy? 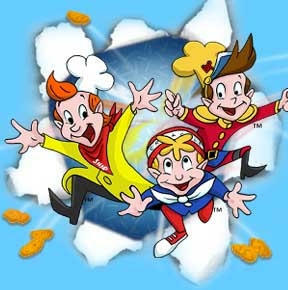 Kellogs: What Makes Snap Crackle Pop?